Joe Conason is a fellow at Type Media Center and Type Investigations’ editor-at-large. For 18 years he wrote a weekly political column for the New York Observer, where he formerly served as executive editor, and for 12 years he wrote a weekly column for Salon. He is now editor-in-chief of the National Memo, a daily political newsletter and website. He previously served as investigative editor of the American Prospect, editor-at-large for Condé Nast’s Details, and as a staff writer for the Village Voice. His articles and essays have appeared in Harpers, Esquire, The Nation, the New Republic, the Guardian, and the New Yorker, among scores of other periodicals. A winner of the New York Press Club’s Byline Award, he has covered every American presidential election since 1980. He is the author of Big Lies: The Right-Wing Propaganda Machine and How It Distorts the Truth (St. Martin’s, 2003), a New York Times and Amazon.com bestseller, and co-author (with Gene Lyons) of The Hunting of the President: The Ten-Year Campaign to Destroy Bill and Hillary Clinton (St. Martin’s, 2000), which appeared on both the New York Times and Los Angeles Times bestseller lists. Conason co-produced a 2004 documentary film, The Hunting of the President, which was based on the book and was selected as a special screening by the festival director at the Sundance Film Festival. 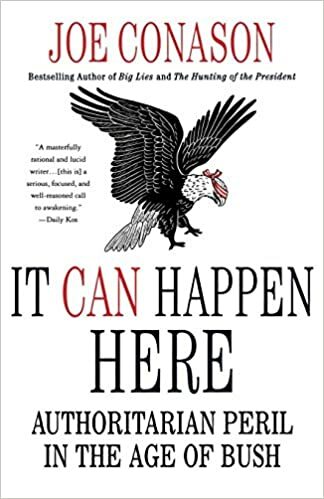 The late Molly Ivins once described him as “one of the best investigative reporters in the country.” Conason also wrote It Can Happen Here: Authoritarian Peril in the Age of Bush (St. Martins, 2007), which The New York Review of Books called a “pithy…well-written account of an administration bent on establishing authoritarian executive power.” His most recent book, published in September 2016, is Man of the World: The Further Endeavors of Bill Clinton, praised by the editors of The New York Times Book Review as one of the best political books of the year. Conason began his career as a reporter for the East Boston Community News, a small neighborhood newspaper, in 1976. From there he went on to join The Real Paper, an alternative weekly published in Cambridge, Massachusetts as a staff writer. He covered environmental, racial, and political issues for both papers. From 1978 to 1990, he worked for the Village Voice as a columnist, staff writer and national correspondent. During his twelve years at the Voice, he covered beats ranging from national political campaigns, City Hall scandals and the Iran-contra affair to major foreign stories in the Philippines and China. In 1985, he co-authored the Voice exposé of Ferdinand and Imelda Marcos’s hidden Manhattan real estate holdings. That worldwide scoop led to Congressional hearings, and provoked the election that preceded the Philippine dictator’s overthrow. Prior to joining the Observer in 1992, he spent two years as editor-at-large for Condé Nast’s Details magazine. During the Clinton administration, his investigative reporting on the Whitewater affair and the Office of Independent Counsel for The Nation and the New York Observer brought him national media attention. He revealed the existence of the “Arkansas Project,” a secret, multi-million-dollar effort funded by a conservative Pittsburgh billionaire to find or invent negative material about the Clintons. In 2004, Conason was one of the first journalists to delve into the background and finances of the so-called “Swift-Boat Veterans for Truth” and its campaign against John Kerry for Salon. Conason graduated from Brandeis University in 1975 with honors in history. He was born in New York City, where he lives today with his wife, Elizabeth Wagley, and their two children. Watching the Republicans strenuously berate Michael Cohen as he appeared before the House Oversight Committee, it was clear that they had no idea who this New York character is or what his testimony means. By Joe Conason in National Memo. The problem for Burr and Trump is that so much evidence of collusion is in plain sight. For the first time in years — perhaps for the first time ever — millions of Americans are not only fretting about the planet’s imperiled future but also organizing behind a visionary approach to its salvation. By Joe Conason in National Memo. The biography of Howard Schultz is the stuff of American capitalist folklore. Now he proposes to repay America by imposing the ruinous rule of Donald Trump for another four years. By Joe Conason in National Memo. Like so many other things in American life, political conspiracy theories just aren’t as good as they used to be. By Joe Conason in National Memo. The unprecedented government shutdown is approaching the end of its first month with no foreseeable relief. The costs and the risks are quickly becoming intolerable. By Joe Conason in Alternet. Amid the ongoing uproar over Mitt Romney’s snooty remarks at a Florida fundraiser concerning the “47 percent” who pay no federal income taxes, the party’s high-rolling host hasn’t drawn quite the attention as he deserves. If there is one thing this three-country tour has proved, it is that Mitt Romney’s handlers cannot trust him to cope with unscripted questions. What's Holding Up The Zadroga Bill? To understand the depths of shame and cynicism in the partisan stalling of health legislation for 9/11 first responders, it is only necessary to recall how eagerly Republican politicians once rushed to identify themselves with New York City’s finest and bravest. 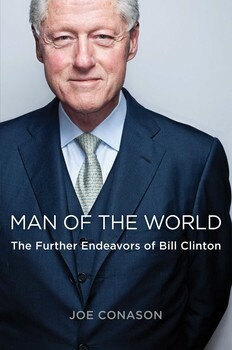 Veteran political journalist Joe Conason brings you along with Bill Clinton, as the forty-second president blazes new paths in his post-presidential career. 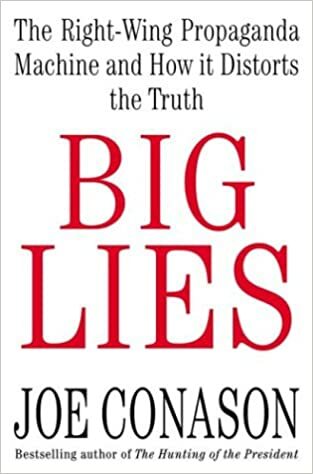 In Big Lies, Joe Conason rips through the ten most damaging lies perpetrated by the right wing propaganda machine. Big Lies confronts right-wing slander and bias with a long-awaited, badly-needed counterpunch to the deceptions that have plagued American politics for a generation.